Official numbers are in from the State Election Board, and the voter registration in Oklahoma as of November 1st, 2014, stands as follows: 884,150 Democrats, 881,253 Republicans, 257,045 Independents, and 8 Americans Elect. Democrats hold the plurality by a mere 2,897 registrants. Compare the above map to the one from January, at this link. Since January, Custer County moved from plurality Democrat to plurality Republican. 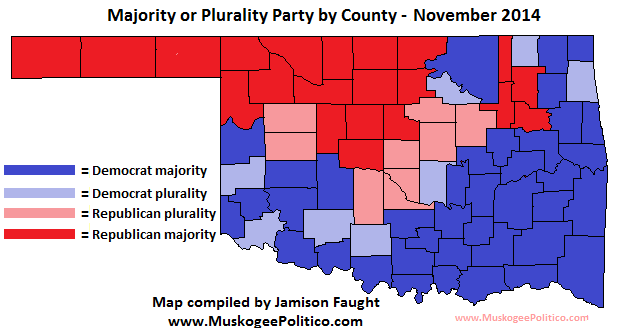 Beckham and Comanche Counties moved from majority Democrat to plurality Democrat. Registration swung in the Republican direction by 1.44%. Every county moved towards the GOP. 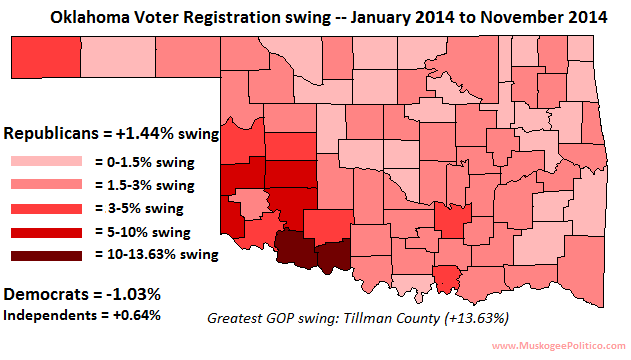 Tillman County continues to be the county with highest GOP growth.